Prince Edward Island stamps first appeared in 1861. Prince Edward Island is located in the Gulf of St. Lawrence, North of Nova Scotia and East of New Brunswick. 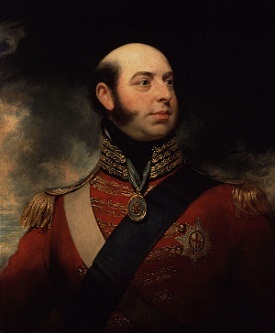 The island is named after Prince Edward Augustus, Duke of Kent and Strathern (1767-1820), the fourth son of King George III and the father of Queen Victoria. The prince lived in both Quebec and in Nova Scotia at various times between 1791 and 1798, and he is credited with being the first person to use the term "Canadian" to describe the English and French settlers in Upper Canada and Lower Canada. 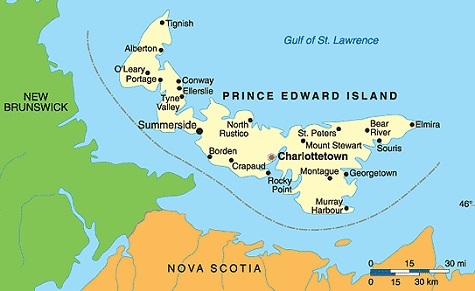 Prince Edward Island's claim-to-fame is the Charlottetown Conference, held there in 1864, from which it gets its nickname, "The Cradle of Confederation". This was the first of three conferences leading to the unification of the British North American colonies and the establishment of the Dominion of Canada on July 1, 1867. Oddly enough, Prince Edward Island didn't join the Dominion of Canada until 1873, becoming the seventh province of the new nation. The first Prince Edward Island stamps were issued on July 1, 1861. The stamps are typographed, perforated 9, and they are printed on unwatermarked paper. 2 P. (1861 - Scott #1) - Dull Rose, Deep Rose. 3 P. (1861 - Scott #2) - Blue. 6 P. (1861 - Scott #3) - Yellow Green. A very rare variety of the 2 P. denomination also exists rouletted, instead of perforated. Between 1862 and 1868, the 1861 designs were reissued with smaller perforations and three new denominations were added. These new Prince Edward Island stamps were printed on white and yellowish papers. They also have varying perforation gauges ranging from 11 to 12. Please refer to the specialized catalogs for details. 1 P. (1862 - Scott #4) - Yellow Orange, Brown Orange. 2 P. (1862 - Scott #5) - Rose. 3 P. (1862 - Scott #6) - Blue. 4 P. (1868 - Scott #9) - Black. 6 P. (1862 - Scott #7) - Yellow Green, Olive Green. 9 P. (1862 - Scott #8) - Violet. A rather common error on the 2 P. denomination has the word "TWC", instead of "TWO". The 4 1/2 P. denomination stamp shown above was issued on June 1, 1870. This stamp is engraved and perforated 12. 4 1/2 P. (1870 - Scott #10) - Brown. The six decimal currency stamps shown above were issued on January 1, 1872. These new stamps were printed on white and yellowish papers and they are perforated 12 or 12 1/2. 1 C. (1872 - Scott #11) - Brown Orange. 2 C. (1872 - Scott #12) - Ultramarine. 3 C. (1872 - Scott #13) - Rose. 4 C. (1872 - Scott #14) - Green. 6 C. (1872 - Scott #15) - Black. 12 C. (1872 - Scott #16) - Violet. The Crown Colony of Prince Edward Island joined the Canadian Confederation in 1873, becoming the seventh province (or state) of the Dominion of Canada. Since then, Dominion of Canada postage stamps have been used within Prince Edward Island.